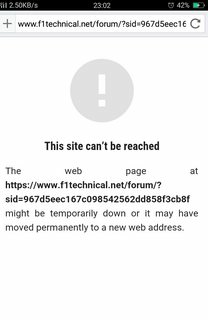 Hey there guys, the last several days, whenever I try to access the forum on my mobile it says it's not available and may have changed web address. I haven't seen anybody else bring the topic up, so I'm wondering what's going on ? Problems probably started since our full switch to https, but I cannot reproduce this. Did you try to use another browser on your mobile? Or reset browser cache / cookies? One of the things I've noticed is that the rating system doesn't work on mobile either. when you click "recommend" or "rate down" nothing happens. it's been like that for a year or more i think. fyi, i think i might have accidentally reported your post (fat fingers). I had not able to connect via Tapatalk on iPhone/iPad for the last week or so at least, but it is working now, FYI. Hey there Steven, thanks for the reply mate. Yeah I did reset the browser/cache and all a few days ago, but I just kept getting the same. It seems to be working fine now though. It updated overnight as well, so maybe something was going on with my browser that needed fixing ? Anyhow, thanks for all the replies. P.S. I can't recommend or downvote while using my mobile either never have, but I don't think it really matters. Confirmed on my Android with Chrome: not working. O god that will be super painful to fix. But maybe this info will help you guys sort it ? I understand that as of Android 5, Chrome is the default browser. I think there is little to no maintenance being done anymore on the Android Browser, so actually I don't know how important it really is if it's only in that browser. So I just checked my phone. It's telling me the chrome version is 62.0.3202.84, I have no idea if that's the latest ? Hey there to anyone that's listening. One thing that has come up in this thread is that you can't upvote from mobiles. Not a huge issue, but it still seems impossible. Can that be fixed easily ? ? ? Hope this info helps. Keep up the good work. OK mate cool, thanks for the info. I'll check my phone again for updates, maybe that's all it is ?